St. Andrew’s Church is just as interested in people outside of it – including those who are usually shunned by society at large – as it is in those who belong to it! It was out of that spirit of caring that Havilah came into being. Through Havilah the church expresses its belief that EVERYONE is a child of God and that no-one should ever be written off. Havilah is a three-hours-a-day, five-days-a-week drop-in service open to anyone seeking company and non-judgemental listening. We offer simple food and drink – tea, coffee, biscuits, soup lunches – between 12pm and 3pm. We operate from Community Spirit, the community outreach venture of St Andrew’s which is just up the road from our church premises, right in the middle of the Fisheracre shops. 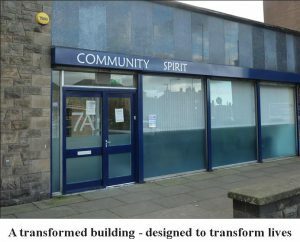 Community Spirit is the home for Havilah and other activities of St Andrew’s Church, and also open for other community uses. “A river watering the garden flowed from Eden; from there it separated into four headwaters. The name of the first is Pishon; it winds through the entire land of Havilah, where there is gold. The gold of that land is good; aromatic resin and onyx are also there.” (Genesis 2:10-11). We want our Havilah to be a place of abundant goodness for those who visit, where they can experience the river-flow of God’s love and care for them. Havilah began in 2006 in response to the desire that some of our number had to reach out in love to the many in our community who, for whatever reason, often find themselves excluded, isolated and unloved. Originally we opened on a Monday morning for 2 hours serving tea, toast, offering a listening ear and, most importantly, the love of our Lord Jesus. This quickly moved onto 3 days a week for 3 hours over lunch time, allowing us to add a soup lunch to what was already on offer. In general terms, the first year was about getting started and though some people came, numbers remained low. By the end of 2007, however, there had been something of a breakthrough and the team was welcoming 12-16 men and women into our halls on a regular basis. This steady stream grew as more and more people began to find something of what they had been looking for. By the end of 2009, numbers had grown to the point that over 100 different individuals came in to spend some time at Havilah each month – which proved both that the need is great and that we have something to offer. In May 2010 we had days where over 40 people could be found in Havilah, and during July we had 308 visits. Despite the small size of the team, the work that we have been able to do has at times been quite outstanding. This is due to the volunteers being fully committed to their ministry in Havilah, which God has placed in their hearts, and the love of Jesus that pours from each and every one of them. There is a tremendously positive atmosphere which is definitely charged by the Holy Spirit. The work is supported by a small Management Group, led by our minister Martin Fair, to provide governance and focus on identifying and securing funds for the expansion of the work. Jim McLeod is vice-convenor of the Management Group, and Tracey McLeod as our Project Worker heads up a growing and very passionate band of volunteers who give time regularly to Havilah’s work. 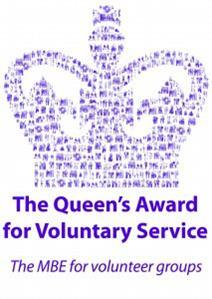 Karen Reaney is our part-time Administrator as well as being a volunteer at Havilah. In addition to the support of St Andrew’s, we have attracted funding for our core costs from the Church of Scotland’s Parish Development Fund and from Angus Council’s Alcohold and Drug Partnership. As the work expands, we are seeking further sources of funding. Our team has shown levels of commitment and perseverance on an astonishing scale; with only a relatively small number on the team and the ever-growing numbers of visitors each day, it puts great demands on each one. But though it is demanding, it is also proving to be worthwhile and rewarding. Of course it should be; as the Gospels make clear, this is the kind of ministry that Jesus was involved in!! So, to be ministering in Havilah is to be doing as he did – in love, getting alongside those looked down on and despised. If anyone feels they are being called in this direction, have prayerfully considered the implications of this work to those we are ministering to, and know they will be fully committed to this powerful ministry, please contact Tracey McLeod on 07906 275636. Most churches don’t get involved with this group of people and generally such people are pretty clear in their minds that they wouldn’t be welcome in churches. But here at St. Andrew’s, we’re beginning to change that. It’s a costly business in many ways and some might say it’s the kind of work that’s more trouble than it’s worth. But it’s what Jesus would say that matters. The work and needs of the Havilah ministry are regularly highlighted in our monthly magazine, Quest, and also in our worship services.